Born: Tivoli, Italy, circa 1910. Family: Two marriages; second to Duchessa Simonetta Colonna di Cesaro, 1952. Career: Apprenticed to Paris tailor, circa 1930s; took over his parents' Italian couture house and thrived in the 1940s and 1950s; formed Simonetta et Fabiani, 1962; returned to solo designing, 1960s; retired, 1974. Fairchild's Dictionary of Fashion, New York, 1988. 20th Century Fashion: The Complete Sourcebook, London, 1993. Callan, Georgina O'Hara, The Thames and Hudson Dictionary of Fashion and Fashion Designers, New York, 1998. Robertson, Nan, "Happily Wed Pair Compete for Rome's Fashion Trade," in the New York Times, 19 October 1955. Emerson, Gloria, "Husband-and-Wife Team," in the New York Times, 21 July 1961. Morris, Bernadine, "Despite Dire Predictions, the Couture Carries On," in the New York Times, 19 July 1973. Alberto Fabiani, born around 1910 in Tivoli, Italy, was the son of couturiers. His parents had launched a fashion house in Rome in 1909. Fabiani was further exposed to fashion through an apprenticeship with an Italian tailor, a family friend, in Paris, where he worked from age 18 to 21. He returned to Italy and, five years later, took over his parents' business, renaming it under his own label. His quickly became one of the top couture houses in Italy. Fabiani is best known for his uncluttered tailoring and conservative designs, whether creating one of his famed chemises, a sheath dress, poncho coat, long tunic top, or even a fur. Over the years, he became known as "the surgeon of suits and coats," a term coined by Nan Robertson in the New York Times in 1955. Several years later, in July 1961, Gloria Emreson of the New York Times pointed out that fashion editors had called Fabiani's designs "a quiet marvel of architecture." Fabiani was among the designers who led something of an Italian renaissance during the 1950s. Italian designers, including his parents, had previously looked to Paris for inspiration, but during the 1950s, they began to trust their own Italian sensibility. Fabiani was emblematic of this movement and became one of the best-known Italian designer labels, recognized not only in Italy but increasingly throughout Europe and the United States. In North America, however, Fabiani was outshone, at least in terms of publicity, by his second wife, the Duchessa Simonetta Colonna di Cesaro, later Simonetta Visconti, known professionally as Simonetta. They met at a fashion show in 1949, after both were well established as designers—Simonetta had risen to the top tier of Italian designers during the 1940s—and were married in 1952. The two had a child together, as well as one each from previous marriages. 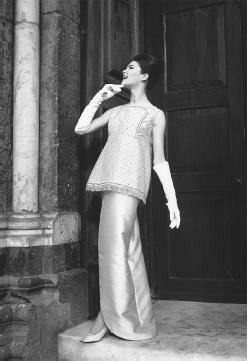 Alberto Fabiani, spring/summer 1963 collection: two-piece evening dress with the top embroidered in rhinestones and gold, and silver-colored fringe. Fabiani and Simonetta were often the subject of fashion industry gossip over what they discussed at home, since they were two of the top fashion houses in Italy and fierce competitors. They always maintained that they did not discuss the particulars of their lines with each other but simply reviewed trends together before beginning each collection, taking a look at each other's work for the first time during runway show dress rehearsals each season. Fabiani became known in the U.S. and around the world for his clean lines, his quality tailoring, and his conservative yet imaginative women's clothes, whereas Simonetta's reputation was established through the creation of highly feminine sportswear and cocktail dresses intended for a young female customer. The two had contrasting personalities as well: Fabiani was reserved while Simonetta was very outgoing. Although they adamantly denied they would ever combine their two houses, the couple did try to do so briefly in 1962, forming Simonetta et Fabiani in Paris. The effort was a success at first but failed quickly, and Fabiani returned to Italy without Simonetta. (Two years later, she retired from designing and established a leper colony in India.) He returned to designing alone, regaining his status as one of the leading couturiers in his home country. He created not only apparel, specializing in suits and dresses, but accessories as well. Fabiani's designs were timeless. He was in touch with the current trends each season, but his pieces were classics that always came back into fashion. And despite his conservatism, he was also an innovator, creating new trends—especially during the 1950s—such as the cocoon silhouette (fitted in front, loose in back) and pleated column dresses. His tent coats, introduced in 1960, made a particular splash. Many of these innovations were disliked at first but were eventually embraced by consumers, retail buyers, and critics alike. In fact, Fabiani's designs were some of the couture pieces most emulated by American retailers in the 1950s and 1960s. Fabiani retired in 1974.